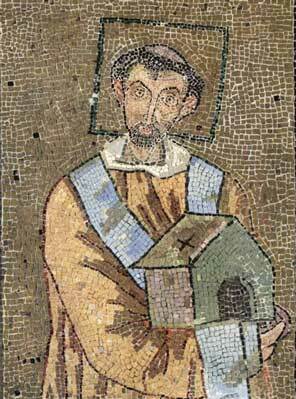 John VII was pope from 705 to 707. A successor of John VI, he was also of Greek nationality. The son of one Plato and allegeldy born in Rossano, Calabria in Magna Graecia, John VII was in good relationships with the Lombards, then ruling much of Italy. He seems also to have acceded to the request of the Eastern emperor Justinian II that he should give his sanction to the decrees of the Quinisext or Trullan council of 692. John VII was a very learned man for his time. He was elected pontiff in March, 705. In 707, Aribert II, king of the Lombards, restored to him the Cottian Alps. They were thus called from Prince Cottius, who for a long time possessed them under the Emperor Octavian Augustus. They formed the fifth province of Italy, made part of Liguria to the confines of Gaul, and contained Tortona, Bobbio, Acqui, Genoa, and Savona. Previous to the coming of the Lombards, the Cottian Alps were administered by the popes. The Lombards usurped those provinces in spite of the remonstrances of the various pontiffs. Aribert caused a diploma to be drawn up in letters of gold, and in that document he recognized the property of the Holy See; it was afterwards confirmed by King Luitprand, under the reign of Gregory II, as is related by Paul the Deacon. The Emperor Justinian II having sent to John the canons of the last council held at Constantinople, with the request that he should confirm what he should approve, and reject what he should disapprove in them, John returned the documents unread, because the council had not been assembled with the intervention of the papal legates. Anastasius the Librarian blames John for this conduct, and thinks that, as in those canons there was much that was good, John would have done well to approve them, with the exception of such canons as were bad. Feller and Novaes judge John, perhaps, too severely upon this subject. Feller quotes the opinion of Fleury, who says that : "John, fearing to displease the emperor, sent back those volumes without correcting anything in them." Novaes quotes the opinion of Christianus Lupus, who also blames the pontiff, on the authority of Anastasius. 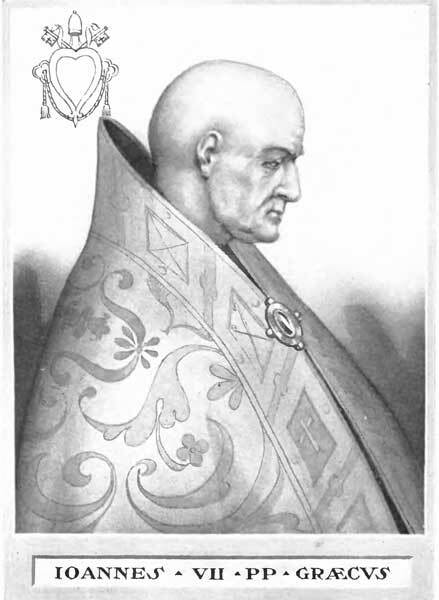 But, considering the conduct of Constans towards Pope Martin, and the services rendered to Pope Sergius and John VI by the soldiery of Rome and Ravenna; considering, too, the perverse and hypocritical nature of Justinian II, and the natural instability of the soldiery, we may judge John VII less severely. Evidently, had he acted as Anastasius, Christianus Lupus, Feller, and Novaes seem to advise, it might have happened that, Justinian approving what John might have approved, but then refusing to reject whatever John might have rejected, the already embarrassing circumstances would have been fatally complicated by such a course being adopted by the Holy See. This pope had the magnanimity to expose himself to great dangers ; his name has been compromised during the succession of a thousand years, while he was really a sagacious pontiff, ready to follow sage counsel and slow to write. We should all concede that now. The misfortunes of Honorius, abandoned by the legates of the sixth council, were a for midable warning to the successors of that pope. The course pursued by John VII entailed no more evils on the Church, gave Justinian no more opportunity for invading the rights of the Holy See and crushing its rising power. He did not postpone the epoch when that power was to take its majestic course amid the nations that honor a spirit of order and civilization, becoming, as we shall see in the sequel, the regenerative power in Europe. There are several monuments of John in the Church of St Maria Antiqua at the foot of the Palatine Hill; others were formerly in the chapel of the Virgin, built by him in the basilica of St Peter and still visible in the grottoes under the basilica. He also restored the monastery of Subiaco, destroyed by the Lombards in 601. John VII governed the Church two years, seven months, and seventeen days. In one ordination he created fifteen bishops, nine priests, and two deacons. He died on the 17th of October, 707, and was interred in the Vatican, in front of the altar of the Madonna, now called Madonna of the Sudorio, which he had himself set up. The Holy See remained vacant three months. He was succeeded by Sisinnius.